The prize fund will be available to any registered crew in the JBRC driving one of the brand’s iconic 208 examples and will be awarded based on their performance in the series. There will also be the opportunity for the top PEUGEOT crew in the series to tackle Britain’s round of the FIA World Rally Championship at the end of the season thanks to a free entry to Wales Rally GB. PEUGEOT UK has secured the support of PEUGEOT SPORT and TOTAL for its drivers which means there will be £4,000 per event up for grabs. The first 208 R2 JBRC registered contender to finish on each rally will receive an impressive £2,500, with £1,000 awarded to second place and £500 to third. The Junior BRC is one of the most hotly contested championships in Europe and is open to competitors under 26 years of age. Centred around the 2-wheel-drive R2 category, it is the internationally recognised class for the development of young drivers which PEUGEOT SPORT has fully supported since its inception. Talented youngsters will tackle six rounds of the Championship in a bid to win a stake of the prize fund on offer, but will have to endure some of the biggest challenges in rallying during the season. The Cambrian Rally kicks off proceedings in just over a week’s time, taking in the forests around the Llandudno base in North Wales. Made famous by the WRC round Wales Rally GB, the muddy and treacherous gravel surface will be the test of many talented drivers. The series then shifts onto asphalt and a trip to Ireland for the West Cork Rally in March. This iconic event takes place on the closed public roads around Cork, testing skill and bravery to the limit. The Pirelli International Rally brings crews back to gravel and the Kielder Forest in north-west England for a one-day blast in April. The Ypres Rally offers a trip into mainland Europe during June where the JBRC is a guest series in Belgium, meeting some of the best drivers in the world on the notorious closed public roads around Ypres. The Ulster Rally keeps with the asphalt theme in August, taking in classic Northern Ireland roads around the Antrim rally base. The season finale heads into Scotland and back onto gravel for the Galloway Hills Rally which sees the super-fast gravel stages near Castle Douglas being utilised in the championship swansong. 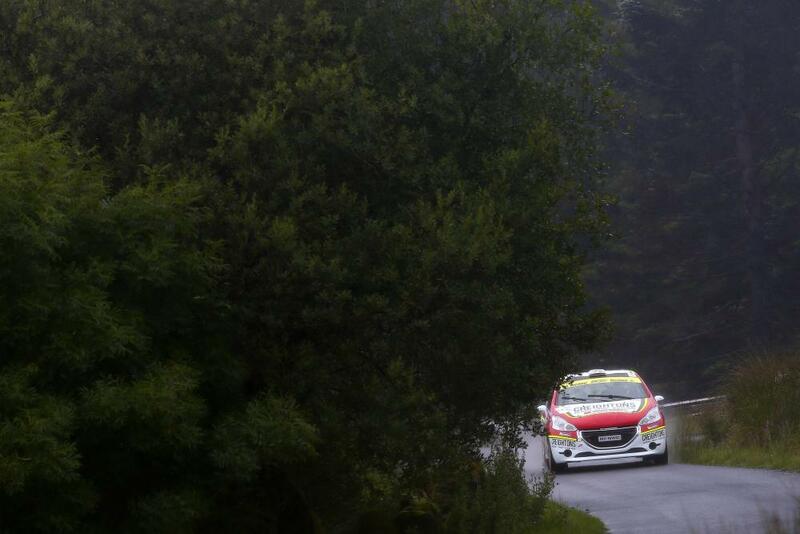 At the time of writing, six PEUGEOT SPORT 208 R2 crews had signalled their intention to contest this year’s Junior BRC. To support the contenders in the championship, distributors ‘Race and Rally’ will provide on-event back up for crews competing in the French manufacturer’s cars. Raymond Moore, Director of the PEUGEOT SPORT distributor in the UK is delighted with the partnership with PEUGEOT UK and TOTAL and the incentives on offer to the Junior BRC crews. “The Junior BRC is always one of the closest fought categories in rallying and certainly the breeding ground for future talent,” says Moore. “The PEUGEOT 208 R2 has been at the forefront of Junior rallying for many years and retains its stature as one of the of the leading marquees in the series. The prize is fantastic news for our Juniors and I suspect it will bring out some fierce battles to be the winning PEUGEOT. We are delighted to be able to offer our Juniors a prize fund this season and I must extend huge thanks to PEUGEOT UK and TOTAL for their support.